Much of the early stages of the Main-Sequence Turnoff for a high mass star is the same as a low mass star. It is important to state that while the fusing of hydrogen to helium is being performed in both low and high mass stars, high mass stars primarily burn hydrogen through the CNO cycle (Carbon, Nitrogen, Oxygen). Carbon acts as the catalyst in the fusion of hydrogen and nitrogen and oxygen absorb the protons to create helium. The main reason for this is increased temperature and pressure at the core than a low mass star. The hydrogen burning shell and helium ash core also exist in the high mass star. One major difference between a high mass star and a low mass star at this point is the helium flash - there is no flash of helium fusion in a high mass star. But there is a limit. Iron cannot fuse, and when it tries the end result is a highly compacted core and intense temperatures. The core density is 4 x 1017 kg/m3. This is very degenerate and cannot be compressed further. The intense heat generated by this compression (core bounce) blows the star apart in a type II supernova. Click on the image to the left to view an animation of a supernova. 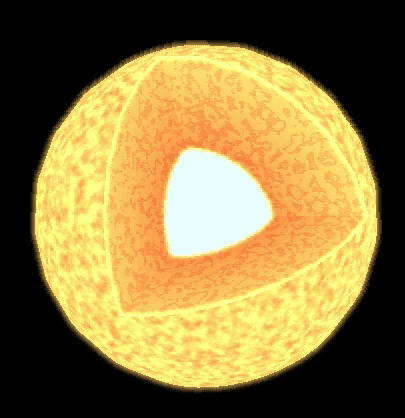 In this video, two things happen: the core collapses, explodes and begins to expand while the star collapses (video care of Swinburne Astronomy Online). The classic supernova remnant is the Crab nebula. A white dwarf is the degenerate carbon core of a low mass star. As such, a neutron star is the degenerate iron core of a high mass star. Because if its composition (and energy at the time of compression), intense magnetic energy emanates from the neutron star, and it is spinning rapidly (several thousand times a second). The image above demonstrates how fast a pulsar can spin. What is also interesting is that they are extremely accurate time keepers. A neutron star also emits strong in the X-ray spectrum. Also, just like a white dwarf, a neutron star can accrete material from a companion star, but superheats it to extreme temperature and spins faster. If the high mass star is around 25 Solar masses, the stellar remnant can compress much further than a neutron star resulting in a Black Hole. It's important to realize that a black hole is not a hole in space, it's just an object with extremely high surface gravity - but since we have yet to "see" one (and we probably never will), we can only infer their existence by its effect on surrounding matter. A good friend and fellow class-mate wrote an excellent paper going into detail on the subject of Black Holes, and he has graciously allowed me to post it here. So for more information on Black Holes, click Black Holes.